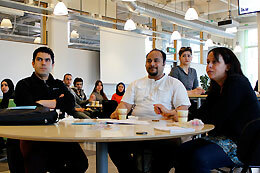 Some 25 asylum seekers jumped at the invitation to a café and academic meeting on Campus Norrköping. Two teachers at the Department of Social and Welfare Studies (ISV) were behind the invitation. They’ve already planned several more. 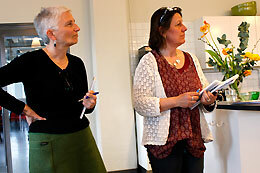 In the entryway to Kåkenhus Building, Sabine Gruber – teacher and researcher in social work – meets the asylum seekers who registered for the evening’s café and academic meeting. Some of the guests come alone, others in small groups; a large group comes by bus from asylum housing in Valdemarsvik. Ms Gruber’s co-worker, Marie Gustavsson, guides their guests to the large green coffee break room, where coffee and cheese sandwiches have been set out. Encouraged by LiU’s refugee initiative project, Ms Gruber and Ms Gustavsson took matters into their own hands and invited people to an unbiased academic conversation about opportunities and desires from both directions. Also on the bus from Valdemarsvik was Nhela Ali, (at right), communications officer for asylum seekers in the municipality. Nour Chamoun was one of the participants at the meeting. 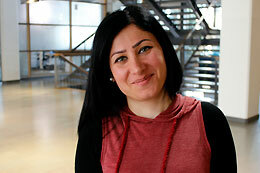 She’s learned a bit of Swedish, but English works better so she is also a teacher of English. She hopes to be able to attend some of the international courses in English that Remeso has, which they are considering opening to ‘shadow students’. After the evening’s meeting, it was clear that many had started and/or interrupted their studies in their home countries. They have questions about how they could continue their studies in Sweden, how they can get access to programmes or opportunities for supplementary qualification. “I think this reflects the questions that many asylum seekers around the country probably have. It’s important that universities and colleges can come together with opportunities for supplementary qualifications, ‘fast tracks’ and the like,” Ms Gruber says.